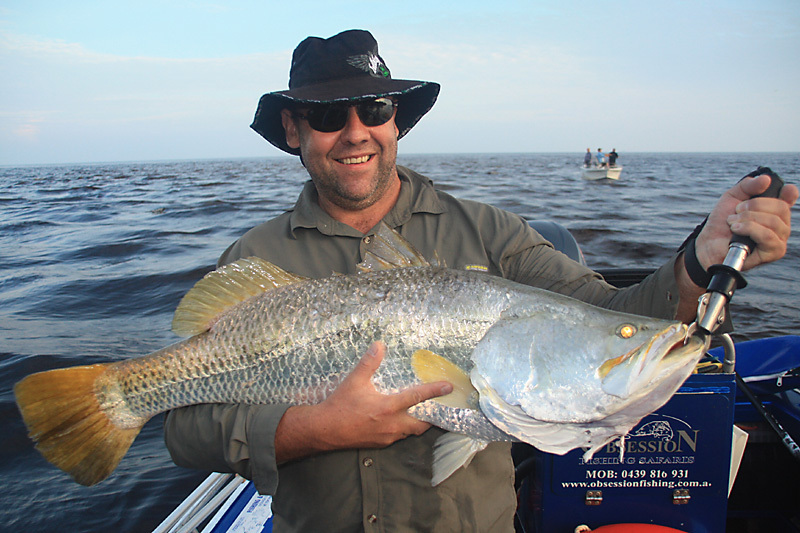 Obsession Fishing Safaris’ Justin Jones has driven back back from Point Stuart today, doing the 600km “Pine Creek detour” drive in about five hours. 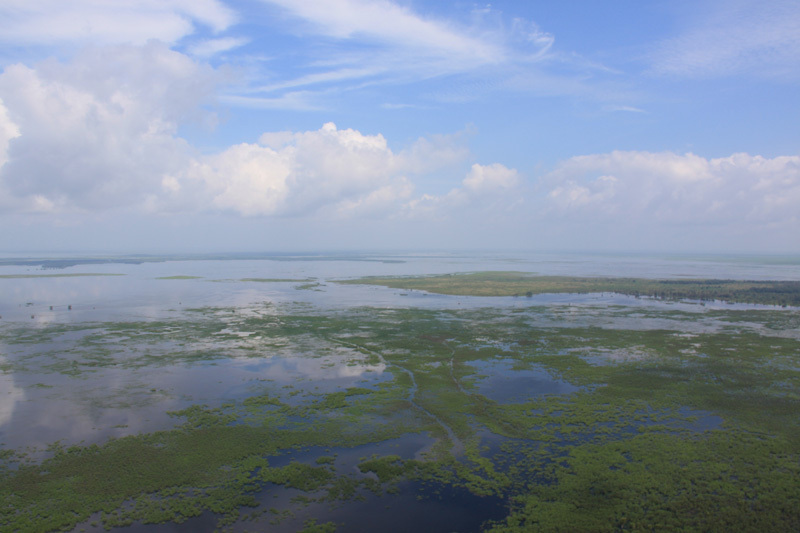 He said: “All of the bitumen is in good condition with the odd pothole here and there, the only water over the road was at the South Alligator River culvert, which is running at .2 over the road. “There were plenty of barra scales on the bridge from last night’s session. “As for Shady Camp, the road is in great nick as it has dried out and is extremely firm, with just one or two washouts. “The water has backed up to the start of the carpark area but there are no hassles in launching. “All of the usual haunts around the first two barrages down from the main barrage are all under water. “And the water is over the banks right down to Alligator Creek. “All the big fish were hooked on 16A Bombers in gold and chartreuse. Mad keen fishos from Darwin have been bypassing the flooded Arnhem Hwy to visit Shady Camp via the Pine Creek detour, and the results have been worthwhile. 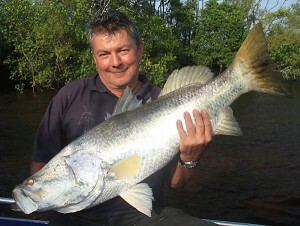 Several metre-long barramundi were landed yesterday in the run-off from Cyclone Carlos. Here’s a good fish, by Daryl Pervis of Victoria, fishing with Justin Jones of Obsession Fishing Safaris. Aerial photography reveals that Marsh Creek is flowing well now, but the Mary River catchment did not get as much water from Cyclone Carlos as the Adelaide and Daly Rivers. The Adelaide River floodplain after Cyclone Carlos. Cyclone Carlos has sent the NT’s Daly and Adelaide Rivers to major flood levels, which bodes well for barramundi run-off fishing in 2011. It may be a record fishing year for these two rivers. Cyclone Carlos dumped more rain on Darwin in 24 hours than Cyclone Yasi inflicted on any Queensland town. Darwin recorded a total of 339.6mm in one day, a record. The slow movement of Category 1 Cyclone Carlos made an impact on Darwin, in terms of flooding and wind damage. The highest rainfall during Cyclone Yasi was only 159.6mm. Cyclone Carlos levelled many trees in Darwin, mainly the big old African mahogany trees that have shallow root systems. 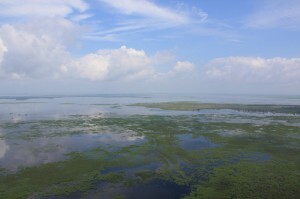 Kakadu rivers are also filled, adding to the overall fishing optimism for 2011.